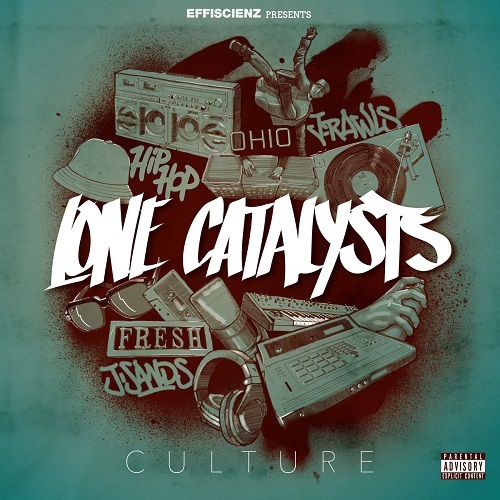 RapReviews.com Feature for April 3, 2018 - Lone Catalysts - "Culture"
If the similar cover motif is any indication, Lone Catalysts' "Culture" can be understood as an answer of sorts to Migos' "Culture," a release that with certainty has reached more ears than the entire Lone Catalysts catalog ever will and that has already been followed up and doubled up by the just as wide-reaching sequel "Culture II." What some might view as a one-sided dialogue, would in fact in hip-hop be seen as a legitimate offer to negotiate. Nobody asked J. Sands and J. Rawls for their opinion on a trio of rappers that got it and flaunt it and simultaneously claim the c word, but that doesn't mean that they don't have one, and so in true hip-hop fashion they seem to have decided to counter with their own definition of culture, hip-hop or otherwise. Jermaine Sanders and Jason Rawls had been making music together since the mid-'90s, but didn't hit the international indie circuit until 2001 when their boldly titled debut "Hip Hop" marked them as to-the-letter inheritors of rappity raps and jazzy beats, even as their laid-back disposition ran the risk of reversing their intended revitalization of hip-hop into its opposite. "Hip Hop" was hip-hop having calmed down after its tumultuous adolescence, still passionate and purposeful, but more in spirit than in reality. While the producer and the rapper have kept themselves busy over the years, their 2017 release, at least ideologically, signals a return to the fundamental approach of their debut. Some of "Culture"'s song titles suggest that LC intended to break so-called hip-hop culture down to its elements. "Graffiti" is a history lesson on the earliest years in New York beginning with the tags of TAKI 183 and is mindful to give a "shout to the Artifacts" who "flipped the whole scene into a part of rap" (and who later assist the Catalysts on "It's a Demo"). "The B-Boy" features longtime symbol of New York hip-hop Tony Touch, "Rhymes" sees Greg Nice resume his role as hypeman, and Drumat!c provides cuts for "The DJ." Just because I do shows in Wahda, Abu Dhabi"
"Rhymes" deals creatively - albeit not conceptually - with its headline, plus it puts up sonic resistance from a duo that musically usually banks on smooth sailing. The gruff late 1980s groove makes for a bumpy ride in the best possible sense. The vintage shine of "The B-Boy" is even more consistent and "Graffiti" surfs a train of understated boogie funk. While the pros of each of the aforementioned songs edge out the cons, "The DJ" isn't that fortunate. There are enough superior DJ tracks in the vaults to qualify this one as subpar, starting with the humdrum production. Sands earns brownie points with traditionalists by opening his honor roll with early West Coast turntablist Joe Cooley but continues with a boring run-down of names, including come-ons in the direction of female DJ's that seem just a little bit behind the times. Still, should that not be enough reason to be pleased with "Culture?" It could, but it's not. If it was the Lone Catalysts' intent to convert music listeners who are indifferent to 'hip-hop' by their definition, their civilizing prospects don't look so bright. "Culture" doesn't grab you and pull you onto a cardboard or rail yard, or behind a mic or turntable. There's nothing singularly intriguing about it. It doesn't dig deep in the crates, invariably favors simplicity over sophistication and falls behind the duo's individual projects such as "Mrs. Sands" and "The Hip-Hop Affect." It is mostly the sounds that will have you thinking of earlier times instead of 2017 or 2018 - but also the unmotivated use of the n word on the part of Mr. Sands. Worse yet, there is not the slightest philosophical dimension to it. It doesn't even try to spark a debate. The tone of it is so fundamentally pragmatical there's no room for more intense emotions. It ultimately remains as vague about its values as the aforementioned album that may have initially served them as a punching ball. Virtually anybody but the most naive hip-hop enthusiast who is happy with the way things are would put more urgency in their rhymes and beats than the Lone Catalysts do on their fifth album. Imagine a rap group that should be the antithesis of the same old, same old opening an album that makes repeated references to hip-hop culture with a song about haters. That is beyond lame. And it's downright offensive if the vehicle for it is an utterly unremarkable song. Among the more tolerable songwriting efforts is "Different Cities," where Sands demonstrates a writer's eye for detail when he traces the social downward spiral affecting cities such as Pittsburgh, Columbus and Baltimore. But like the others this song just kind of breezes by in typical Lone Catalysts fashion. Even "It's a Demo" - despite taking its tagline from a young hungry Kool G Rap and featuring the Artifacts - gives us Sands and Rawls at their most mellifluous. If that is just fine by you, and also if you are a longtime fan, "Culture" provides a handful of undeniably mellow moments, including closer "Smiles," whose simple purpose seems to be to end the project on a positive note. Whether or not that was actually necessary is another question. Almost 20 years after "Hip Hop," Lone Catalysts continue to deliver undogmatic hip-hop with an authentic touch (see the various soundbites, the final one being Kid Creole expanding on the origin of the term 'hip-hop'), but give us little reason to actually care about it.